I started food and travel blogging 5 years back, and I started my personal blog www.mylifemystories.com 10 years back ,so when Blogchatter asked the question “where do you see your blof 5 years from now?” I was taken aback. I hadn’t thought about ‘taking my blog’ anywhere. I guess 5 years from now I would still have a blog, or a website or whatever they are calling it 5 years from now. And then the guys at blog chatter started asking even tougher questions, like ‘How do you add value to the lives of your readers?’ and ‘ have you decided on taking up a project on your blog, something that could potentially change people’s perspectives and things like that?’ and then the real questions on ‘how influential are you ?’ came in, and they didn’t just mean the ‘influencer ‘ tag , whereing we calculate how many followers and such that you have. I planned to sit this one out, but then I went back to the time when I started my food blog. Even though I had been blogging for 5 years by then, I still found that I had a lot to learn about writing about food, in a way that it made a connection with my readers. That’s when I had searched and found my bible of food writing “ will write for food by Dianne Jacob”. But writing a book, back then seemed a daunting task, and after an energetic start, I realised that I had bitten off more than I could chew. I have recently started re reading parts of “will write for food” and I decided to try something fun (as well as something that will add value to my readers readings) . Have you guys seen the movie, Julie and Julia? It was originally a blog, which got made into a movie, A girl named Julie, decided to cook every recipe from Julia Child’s cookbook and blog about her journey. I have decided to read a hundred Indian food blogs ! Just the way we celebrate Indian cuisine, it is time now to savour our Indian food writings and encourage our food writers as well. I also will be sharing food writing tips, and have fun to do exercises that you can try at home, and on your blogs. You can tag me with #Indianfoodwriting in my “Let’s write about food “ project . By the end of this month , I hope all my readers are writing with more focus and flair, and I can make a small contribution to the community of food writers and food bloggers in India. End of December I will publish the entire list of food blogs I have read in the month, so if you want to be on that list and want me to visit your blog, leave the link of your blog in the comments below. Join me on my Next blog post on “finding your voice” . I could have called this article the “ultimate guide to attending the International film festival of India,” but I didn’t want it to sound cocky, but after reading it I hope you feel that way. Films like food, help us understand the socio cultural vibe of a place. Food for me will always be the best place to discover a country, state , locality or even a religion, but films come in a close second. 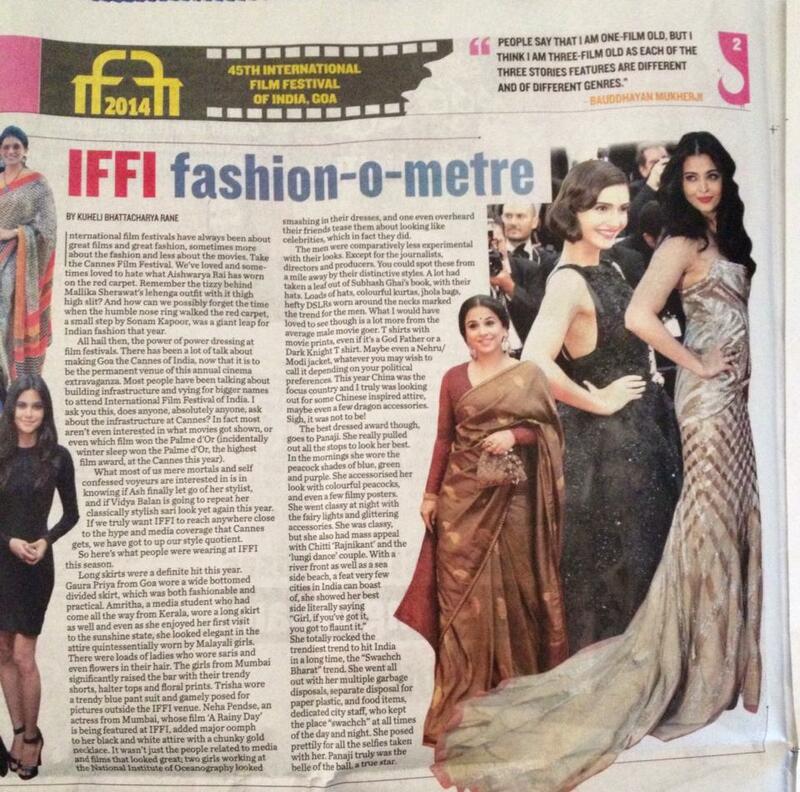 IFFI is not just about movies, it is about stories from around the world. Last year I saw a film about the public health system in Nether lands (I Daniel Blake) and one about a woman instagramer in Saudia Arabia who hides her face(barrakah meets barrakah), IFFI to me is about travelling to lands I haven’t yet travelled to, meeting people and understanding cultures while sitting in a darkened hall, and that’s why I write about a film festival on my travel blog. A film festival is the quickest way to travel the world. 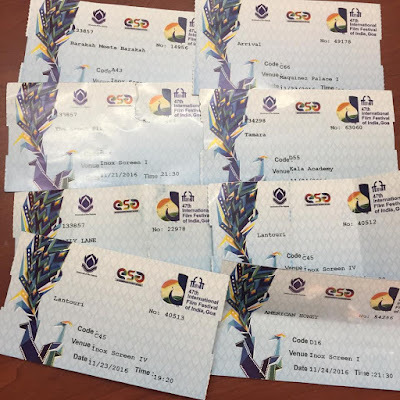 I have been attending IFFI in Goa for 4 consecutive years now, and over the past few years have gathered few tips and tricks on the way to finally have the most paisa vasool experience of the film festival, but even before I started attending IFFI as a cine enthusiast delegate, I have been a secret admirer of it from afar for 10 years now. 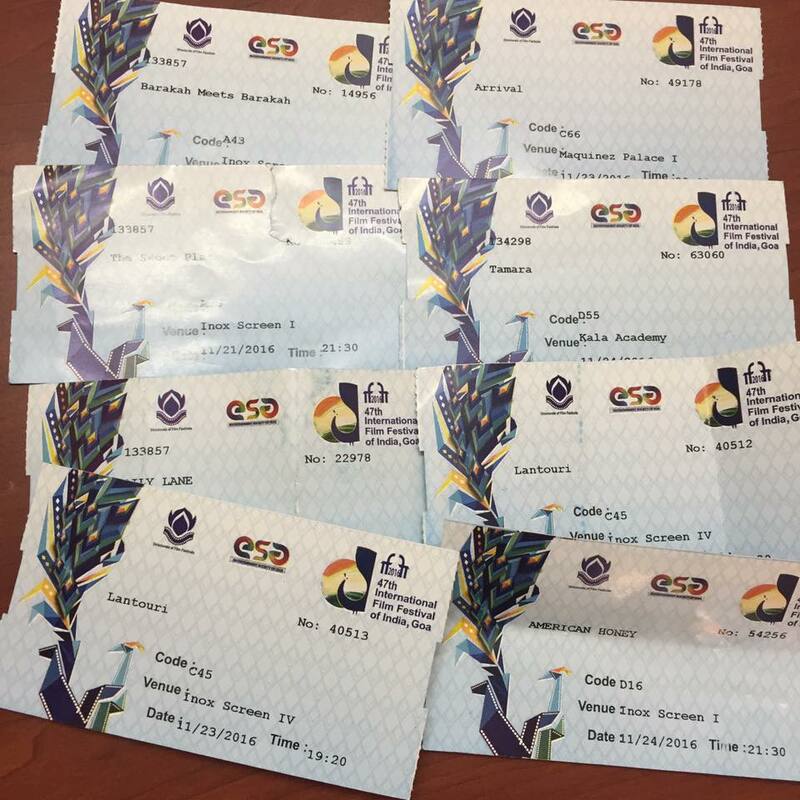 I love movies, but can anyone attend IFFI? Yes! Absolutely. For years, I thought IFFI was only for the film walas; people who attended film school, or work as actors, or in some way related to the movies. Anyone can attend as a ‘cine enthusiast’ provided you register. How do you register? Just fill in an online form at IFFIgoa.org somewhere in October , and the process is tedious the first time around, because you have to scan in your proof of address, and proof of identification, but in later years it is a breeze because you have already done it once. There is a paragraph where you need to fill in your credentials, and that’s the one that had me stumped for years! Then I just filled “ I love movies, I watch a movie every other week, and I also write film reviews on my facebook profile.” So, yes honestly you can write anything, that you belong to a film appreciation club (of one) or anything. No. You have to preregister, read above answer how. They don’t give away delegate passes on site. But, you can get day delegate passes. That pretty much allows you entry for that day , and movies featuring on that day. But, you don’t get the awesome freebie bag, and movie literature that goes with it, or the cool badge. 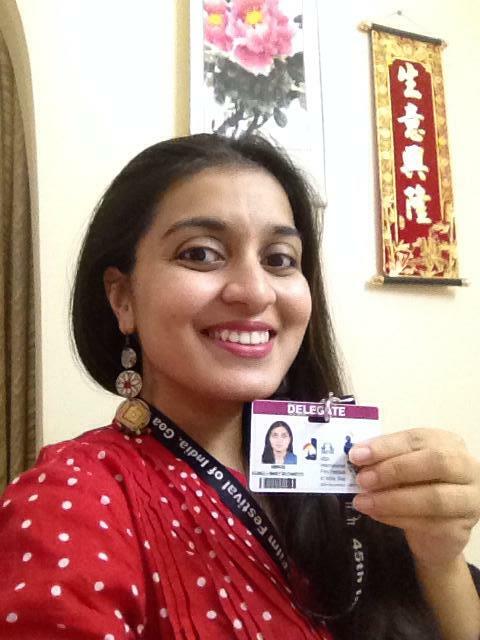 For two years, I did a day delegate pass at Rs 300 a day, Until I gathered enough courage to fill the online form and pay Rs 1000 for 7 day pass in 2014. I don’t want you to make the same mistake , thus the blog. Great ! I registered. Now what? Now, you get a mail, with one code to collect your Badge , and the kit. You can collect it on the first day of the festival, or a day prior. You will also get a login ID and a password, for you to do online login, where you can see all the movies there are, read reviews and see the schedule of movies. You cannot show up at the hall without a ticket. You don’t need to pay to buy the movie tickets, but you still need the pre booked ticket. Ticket bookings start a day in advance, do it online, or go to INOX near the ESG building and get them there. There are so many movies , how do I choose? Ah, now my tips. There is so much and so little time. You get to get tickets for three movies a day, that means 21 movies in 7 days. At 1000 rs for 21 movies, you have already gotten yourself an awesome deal.But, if you follow some of my tips you can squeeze in 5 movies a day as well. Here are my top tips on choosing which movies to watch . a. Award winning movies: Find out which movies made the cut at other film festivals, and try and watch those. (they will almost always be worth your time)follow guys like Sachin Chatte, or the IFFi website to know which award winning movies are playing at IFFi that year. b. Watch foreign films: Hindi, marathi, Hollywood movies will always be available on the small screen, television or on Hotstar , Netflix. Watch something which you cannot otherwise Netflix, like Iranian movie about a lawyer who becomes an Acid victim, or the first Saudi Arabian movie about Instagram, visit an exotic land, through their movie. d. Choose movies playing in the smaller halls : Now here is a top tip. There are 7 halls for IFFi, but not all of them seat equal number of people. Some halls have a seating of around 1000 people (kala academy) while others seat around 100 (maquinex palace), so buy tickets for the small halls. Why? Because 5 minutes before a movie is to be screened, the hall is opened for non ticket holders. A big hall like kala academy is rarely filled up and you can be fortunate enough to get in even if you didn’t pre book a ticket. e. Ask: Almost everyone at IFFi loves movies, and I have always wondered why we don’t have a people’s choice award at IFFi, but since you have to queue up 15 minutes prior to the movie screening, you meet a lot of people while you wait in line for a movie, or when you are drinking a soda between movies, or while you stand in line to pick up next days tickets. Ask what others saw and what they liked, what was not worth wasting time on. Many of the films are rescreened on other days, and you can always catch it again. this year I am keen on watching the bread winner, but I haven’t gotten the tickets (it's housefull) so will have to wait for it to screen again on day 4, which it is, and hopefully get that. So anything else I need to know? Like what do I wear , or what should I eat, can I get my own food, and where do I stay…? WEAR: comfortable shoes, a lot of running between venues, and a lot of standing around in queues. Wear something nice of you want to get noticed. 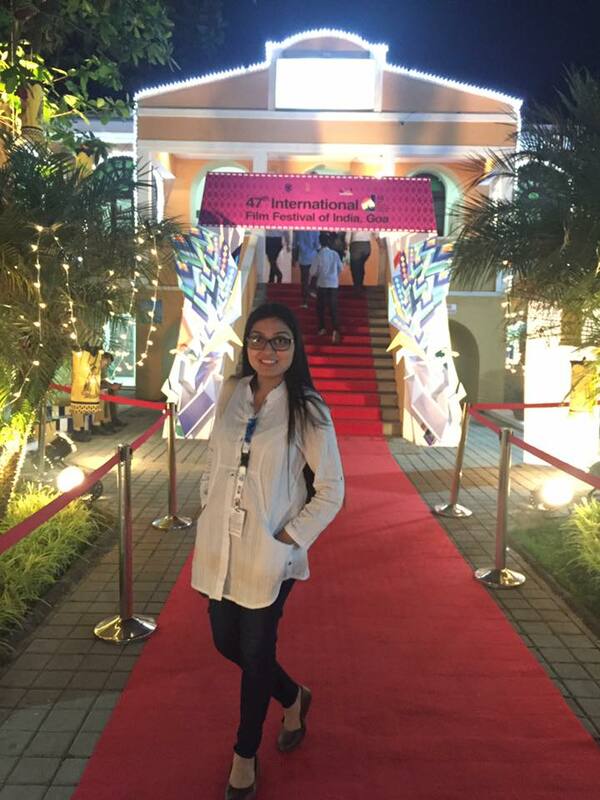 EAT: there are a few staqlls around, and its fun to catch up with friends between films, but honestly during IFFI, I am all about living breathing eating movies, and since I am working full time while attending, I miss out on dinner most of the time. I finish work by 7 so we watch back to back movies of 8 and 10 show, and if I can I catch one in my lunch break at 2 o clock as well. No food or water is allowed in the venues unfortunately. STAY: stay in Panjim, and if you can there are plenty of hotels, hostels on the road from INOX to Miramar circle, stay on that road , so that you can walk to the venues, becuae public transport in Goa is all but non existent, and hiring a scooter (which I did one year) is very scary, because there is literally no parking available anywhere. But residents of Goa, are sweet enough to give you a lift , especially if you are wearing your delegate badge and are a girl. late night movoies after 10 ? yes please! post working two shifts at work, and putting toddler to bed, yes, anything for the IFFI experience. Yes, attend the movies which say world premier, or one where the schedule says has a ‘red carpet’ or ‘cast members’ attending. You get to watch the film with the acors and directors, and after the movie, can ask them questions too. Sometimes get pictures and autographs too. Attend the Masterclasses, which have a lot of technical details for film students and filmmakers, but also for the general public, like this year they have something on Commercial cinema by Farah Khan . 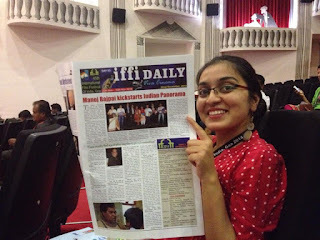 An IFFi supplement paper called the Peacock is an invaluable companion, while you wait in line , or are seated in the halls, and waiting between films, or even as a souvenir to take back of the film festival. It has interviews, and movie tidbits, and all things IFFI. Hope you found the tips useful. 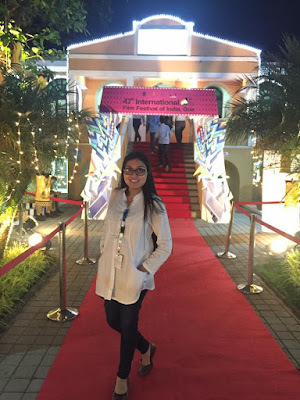 IFFI is one of the best times of the year for me read about it HERE, I have previously written about what to EAT, and what to WEAR at IFFI. The Sula selections “globe in a glass” event came to Goa on November 11 , and it left us in high spirits. First, the fact that it happened in Goa ! This is the second year that Sula is hosting their foreign market imports in an interesting ‘party atmosphere’. The first year saw wine connoisseurs and oenophiles of Delhi, Mumbai and Bangalore enjoying the Sula hospitality; and I am chuffed that Rajeev Samant, founder and CEO of Sula Vineyards chose to include Goa in this year’s annual event. loved the artistic servings of dips and snacks by the Taj Vivanta Panjim hospitality. Third (yes, we are still counting down all that was good about the globe in a glass even), it was open to public. Apparently , last year, it was an invitees only event, but this year, after 7 in the evening, till about 10 , one could partake of the extensive wines and spirits selection for a price of Rs 2000. I think I will let the pictures to rest of the talking. the famed Beluga vodka , the number one vodka in the woorld I am told, and in the background was the russian Mixologist, who won third place in the world Bartending competition, if you had seen my Insta stories, she prepared some fabulous cocktails for us. It was only just recently that I learnt the word Oenophile, meaning wine lover, and I am not very sure yet, how it is pronounced, but I know the exact day that I decided to start having wines. Infact it was also the exact same day, I decided to have alcohol of any sort. We were at a medical conference, my mum and I, and mom being faculty was being put up in the suite class room , in a very plush business hotel. As is the custom in these business hotels, any one staying in the suite/super delux rooms , were hosted to an ‘on the house’ wine and cheese event each evening in the Hotel lounge. There we were surrounded by all possible varieties of fine wines, and I finally knew what a vegetarian feels like at a nonvegetarian buffet ‘I can only have the cheese’ . all glasses were more empty than full , by the end of the night and we were all pretty happy about it! Another such reminiscing was me at the cheese festival , with a four month old baby attached to me in a baby carrier , read about it HERE. It's November , and Goa is gearing up for a packed wedding season, withh many people around the country choosing Goa as the top wedding destination, but did you know that apart from weddings, and honeymoons, you can come back to celebrate the next phase of your couple-life, with a babymoon in Goa ? Goa is known as a lifestyle holiday destination by most, but it is also a ‘lifecycle holiday destination’. Allow me to explain what a lifecycle destination is; it is a holiday destination suited for all of life’s milestone moments. Goa is known as one of the most preferred places for destination weddings, and honeymooners have celebrated their love and lifelong bond here for generations now, with many couples reminiscing how they came to Goa even during their courting time, and many returning to Goa for family holidays in years to come, it was but a natural progression that couples would choose Goa as the perfect way to celebrate their little bundle of joy as expectant parents. Expecting a baby can bring along with it a stork full of doubts and apprehensions , while also being a harbinger of joyous times. It is a time for the couple to celebrate their last few diaper free days, and feeding and soothing free nights, aswell as celebrate the life they are creating. Many couples go on a celebration of their impending parenthood in what is now being termed the “babymoon”. Many call it the “bachelor party “ for expectant parents. Easy accesability: Goa is easily reached by road or flight from most places in India. Travel for babymoon is best during the second trimester as this is the safest time to travel. Most airlines expect to have note from your treating doctor is you are travelling beyond 32 weeks by flight, and they also sign a disclaimer in case of emergencies. Be sure to get a green light from your doctor before planning your babymoon. Long stretches of beach to walk: walking is the preferred exercise during pregnancy and the calming sound of the waves and long stretches of beach are ideal for morning and evening walks. Just what the doctor suggested. Be sure to walk on firm beaches of Vagator, or Morjim, rather than more sandy beaches. Avoid rocky beaches, to avoid chances of injury. Always hold hands with your significant other for added stability and stronger bonding. Pregnancy changes the center of gravity for women, and this can lead to instable gait, especially on loose sand. Yoga and meditative relaxation: Pregnancy Yoga has been known to help in easy child birth, reducing chances of maternal hypertension and diabetes, as well as increased blood flow to the baby and general well being of the mother. Meditation and breathing exercises also help in maternal well being and easy child birth if practiced regularly. Goa is a hub of Yoga enthusists, many of whom are mothers themselves. While most of the resorts which offer yoga , do not have trained yoga professionals for pregnancy, but if you are like me and practiced from Youtube pregnancy classes, doing the same at any of the zen like locations of the yoga centers at the resorts and hotels is a great way to energise. Beach wear and flip flops: Pregnancy means a changing body, and with it a change in body image. The numerous colourful kaftans, halter tieups, flowing beach wear are perfect ways to celebrate your new baby bump. The relatively thrifty pieces available at the beach side shacks means you won’t feel the pinch on splurging on a new wardrobe. Pregnancy also means swollen feet, and when your fancy heels start hurting you, you can turn to the trusty flip flop from the roadside shops as well. The colourful clothes, and funky footwear is surely going to cheer up an expectant mother. Cozy couple time: the same reason that Goa is famous for honeymooners, is also true for babymooners. Plenty of ways to celebrate your togetherness, whether on a private yatch dinner, or a special candle lit dinner on a secluded part of the beach, a treetop dining space, or room service to your room overlooking the sea. Emergency medical care: What really clinches Goa as the perfect Babymoon destination, over more out of reach places such as Andamans, or lakshwadeep, is its balance between city life and touristy places. With competent medical care, nationally accredited hospitals, 24/7 pharmacies, and a well established emergency ambulance service, the state is equipped with handling emergency medical conditions. Always find out the nearest pharmacy and hospital while travelling to your babymoon destination, and as a precaution keep the contact numbers handy. Aqua , aqua , everywhere: The human body is 60 % water, and this percentage increases during pregnancy. Drinking water is an essential part of a healthy pregnancy , and tender coconut water which provides not just water but essential minerals for pregnancy is abundantly available in Goa. With most hotels and resorts equipped with their swimming pools, many of them indoor swimming pools, temperature controlled, and not very deep , with skid free flooring are great for aqua aerobics. Aqua aerobics help in lymphatic flow and reduced bloating in pregnancy and reduce swollen feet. The natural buaoyancy of water, also helps pregnant women literally take the load off thus easing back aches and joint pains related to pregnancy. Spa treatments and massages: Light massage is recommended during pregnancy to calm the mother, help in lymphatic flow, and promote general wellness. Most spas are3 wary of suggesting aromatherapies, foot reflexologies, and other deep tissue massages for pregnant women, to prevent early uterine contractions. Baby friendly food and beverage: What to eat and drink during pregnancy is in itself a whole article on do’s and don’t’s , but whatever the pregnant mothers cravings or aversions are met with assured hospitality at most of the Hotels in Goa. Do let the food and beverage team at the hotel know your preferences to avoid any last miute disappointments. The availability of large superstores, which store the most exotic and foreign of ingredients catering to a whole gamut of tourists from around the world, also means that if you crave for smoked salmon or ementhal cheese or miso soup, you can buy the same at your friendly neighbourhood superstore. Maternity photoshoots: Goa provides the perfect backdrop for your maternity photoshoots. Be it a glorious sunset, or the verdant green farms, or an ancient church ruin, or colourful village scenes, or the psychedelic flea markets to showcase the happy expectant parenthood, the photographers in Goa are now adding maternity photoshoots to their repertoire. Goa gives you ample opportunity to celebrate your expectant parenthood, but then again, the burgeoning life within, is reason enough to celebrate. I began blogging with the aim of chronicling my food and travel adventures and to come back to them as often as I wish, and in that to be able to take my readers along with me on our journeys. This time we were invited to the Ibis Styles hotel in Calangute, Goa. What excited me about the Ibis styles , was the fact that it is the first and only Ibis styles hotel in India. And also the fact that it is a mid-range hotel property situated in the heart of the touristy belt of Calangute and Candolim. The sheer number of children at the property was enough to let one know that it is immensely popular with families. From kids enjoying the kids play area, to swimming, and even a four generation cricket match being played by dadis and chachis, the place is like a very large picnic spot for families. Arrival: I was disappointed to see that it is not a beach side, or even a ‘walk to beach’ property, also it is in a culdesac and has a less than welcoming alleyway. But, this alley is where most of the taxis, and bikes for rent are parked; they may not make a scenic entrance, but it is very convenient to hire a vehicle here. Foyer: Colourful and filled with Goan inspiration in the form of canoes, a faux shell chandelier in the form of a wave, and a brightly painted front desk. They have lovely bright sofas, and even a foot massage corner, while you wait for the formalities. The Ibis Styles, is based on stylish and stylised interiors, with “ Pop, Pep and perky personality “ and the foyer sure has all of those. Rooms: A bit small but comfortable queen size bed for two, and they have a choice of twin sharing of you are travelling with a colleague. They also have rooms adjoining for say families, of four, where the connecting door, opens up to the adjacent room. Since we have a toddler, a single queen bed is fine, but an older child or three travellers, would need an extra bed. There are two wings, and I would highly recommend the stay in Saal wing if you are travelling with kids, since that is where the play area is and also the kids pool. The other wing is kind of more for business meets and more clinical, I thought. All rooms face a pool. Kid friendly options: First off, very safe room, all switches with safety caps, and even though each balcony has a central opening, our kid couldn’t slip through ( he tried) but it was nice for him to just sit there and see the world go by. One of the few hotels which have an open play area , and not in a room; that means that rains might be a problem, and the other that you cannot leave your kid unattended, lest they walk off. but otherwise we loved the open concept, the faux grass made it feel like a park, with swings and slides. We even saw entire families sitting on the grass playing antakshari, while the kids played on the swings. And table tennis. But, here is what really makes it a deal sealer, they have over ten toy cars to ride. For my son it was as if he had entered the place of his dreams. Even his school has just two cars, and the children have to share, but here, there were so many cars, that no child ever needs to share ! We spent every waking moment in the car park, and I think he saw it in his dreams that night too. The swimming pool is small, and at 2.2 feet, it was deeper than the other kids pools that we have been to. Since it is in a shaded area, the water is colder than the water in the adult pool, and even the large pool in the other section is nice and warm. Yes, they have three pools, including the kids pool. They have yet another , play gym park, near the kids pool, and that’s every bit as much fun, and thoughtfully designed as would be expected of a kids play gym. Yes, we woke up very early the next morning, and he couldn’t get enough of it. Sonce it was before my morning coffee, you see me wearing sunglasses, and wishing I could have slept longer on a Sunday. But for kids, Sunday’s are fun-days. Food: One restaurant, the spice it, it serves buffet breakfast , lunch and dinner, as well as alacarte for lunch and dinner. Chef Rahul and chef Mayank, really try and innovate and create interesting meal pairings . the chicken lababdar, and the lachcha paratha along with the chicken Cafreal kebabs cooked in a tandoor are worth trying. Chef Mayank especially made kid friendly king fish and it had the lightest brushing of mustard paste, and while I thought my son wouldn’t have it , he loved it. The potato wedges, were superbly well made, but he refused them. Kids ! If you are feeling adventurous , I would highly recommend the spinach lasagne, with two types of cheese sauce, and arugula and parmegiano, that chef Mayank makes. It is one of the cheesiest , most indulgent things, Ihave had in recent times, and a non tomato based lasagne with peppery rocket leaves and sharp parmesan cheese, is a flavour combination not many chefs dare to experiment with. Activities: cycling, a jeep ride to the beach, a short walk to candolim junction, and loads of shopping options. I would suggest shopping at the really small shop right outside the hotel, since the hotel is in a culdesac, her rates are not as high as the others, and I got the most stylish tshirts for Rs 200. See my Instagram @thefoodietrails for pictures of the three outfits I bought at her store. Resort wear sorted, right there! The artwork at the hotel is what sets it apart from the others. A Ms Venu Juneja is credited to the art consultant, and honestly I would have her consult on my own home , I was that impressed by her Goan Kitschy style and Mario Miranda inspired works of art. On our recent visit , we found everyone very helpful , especially the servers at our table 32. And also budhhadeb the purser who escorted us at the foyer. A place is it’s people, and I think all the other happy guests really added to the holiday atmosphere. Go in groups, or as a family, and make some fun memories.